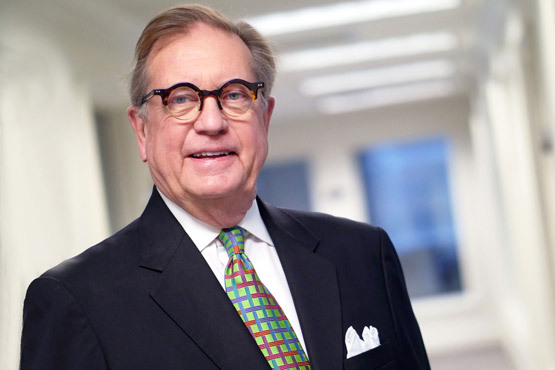 Douglas D. Hawthorne, LFACHE, became Founding Chief Executive Officer Emeritus of Texas Health Resources on Sept. 1, 2014, upon stepping down as Chief Executive Officer. Texas Health, based in Arlington, is one of the nation’s largest faith-based, nonprofit health systems. The system includes Texas Health Physicians Group and hospitals under the banners of Texas Health Presbyterian, Texas Health Arlington Memorial, Texas Health Harris Methodist and Texas Health Huguley. A native of Orange, New Jersey, Mr. Hawthorne grew up in San Antonio, Texas. He earned his bachelor of science degree and his master's degree in health care administration from Trinity University in San Antonio. He served Presbyterian Healthcare Resources in many roles after joining the system in 1970, rising to President and CEO of Presbyterian Hospital of Dallas (now Texas Health Presbyterian Hospital Dallas) and of Presbyterian Healthcare Resources. In 1997, he became President and CEO of the newly formed Texas Health Resources. Guided by the mission of improving the health of the people in the communities served by Texas Health, Mr. Hawthorne successfully implemented a unique vision while conquering several challenges. Perhaps the largest was overseeing the joining of several highly successful health-care brands — Presbyterian Healthcare Resources, Harris Methodist Hospitals and Arlington Memorial Hospital — in creating Texas Health Resources. Texas Health has reaped the benefits of his strategy and vision and has enjoyed a successful integration of the organizations into one health system that serves one in four North Texans. A leader and contributor, Mr. Hawthorne currently serves as the immediate past chair of the Trinity University Board of Trustees. He serves on the American Hospital Association's President's Forum, is a board member of LHP Hospital Group, Inc., and is a member of the Board of Directors of the Bank of Oklahoma Corporate Board (BOKF). He is a member of the University of Texas Health Care Advisory Committee and is a member of the Board of Directors of The State Fair of Texas. He is a member of the Salesmanship Club of Dallas and is Reserve Elder and Trustee of the Highland Park Presbyterian Church. He is a Lifetime Fellow in the American College of Healthcare Executives. Mr. Hawthorne is a past chair of the Health Leadership Council Executive Task Force on the Uninsured, Dallas-Fort Worth Hospital Council, the Texas Hospital Association and of Premier, an alliance of nonprofit hospitals and healthcare systems. He also served as chair of North Texas LEAD (Leaders and Executives Advocating Diversity) Initiative and as chair of the Dallas County Community College District Foundation and of the DCCCD Foundation's Campaign for Excellence Health Professions Initiative Committee. He was formerly on the board and executive committee of the American Hospital Association. A past president of the Circle Ten Council of the Boy Scouts of America, he received the Silver Beaver award from the Circle Ten Council for distinguished service. A recipient of the Distinguished Eagle Scout Award, he received the Distinguished Citizen Award from the Longhorn Council.